Buying Valentine’s Day gifts for all of your friends can get pricey! So this week, we’re showing you how to give the gift of sweet, strawberry love that you can make in minutes! And, get this, a teenager is our chef…so you know it’s easy…but your friends won’t. In a deep bowl, stir together the egg white, sugar, strawberries and lemon juice. Whip with an electric mixer at high speed for 10 minutes. Fold the whipped cream into the strawberry mixture. Freeze for 6 hours, or overnight, before serving. Using small cups/rocks glasses/plastic mini champagne flutes, choose your layers. I chose chopped strawberries for 3 and triple chocolate cookies (crumbled) for 3. Layer your choice on bottom of glass, add mousse, add layer, then whipped cream, then mousse. So super easy to make, and cheap too! 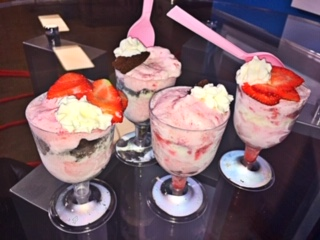 When you whip up this strawberry mousse, brag about it, and tag me in the pictures!